Born in 1871 in Buffallo, NY, Edward Dufner enjoyed a long, successful career as an art teacher and actively exhibiting painter. Dufner was considered the leading Impressionist in New Jersey during a period when Impressionism flourished in various regional artist colonies across the United States. 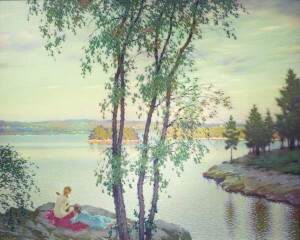 Edward Dufner was one of the first students of the Buffalo Art Students League to earn an Albright Scholarship to study painting in New York. In 1893, he moved to Manhattan and took classes at the Art Students League. Five years later, Dufner and his wife went to Paris where he studied at the Academies Julian and Carmen. Dufner traveled in Europe for five years, also studying with James McNeill Whistler, before returning to the United States in 1903. A major instructor of portrait and still-life painting at the Buffalo Fine Arts Academy from 1903-1907, Dufner resigned in 1908 to teach at the Art Students League in NY. He was an associate member of the National Academy of Design in 1910 and 1929. Dufner received several awards, including a prize at the Paris Salon in 1899 and the gold medal in the National Art Competition in NYC, 1925. In 1910, he held a special Art Students League summer in Caldwell, New Jersey, and spent subsequent summers painting there. Dubbed the "Painter of Sunshine," Dufner favored as a subject joyous spring landscapes, often depicting a stream with swimming ducks, and figures such as women and children in crisp white garments leisurely spending the afternoon outdoors.